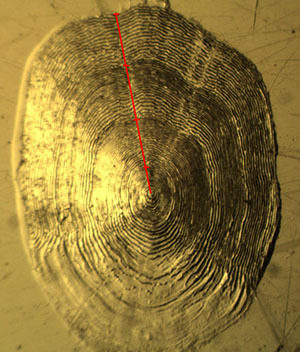 Age data is often required for investigations of contaminant burdens in fish tissue. Ecologic provides fish aging services to clients requiring age and growth data for individual fish or fish populations. Most of our fish aging projects focus on providing age data for fish sampled for tissue contamination, with these data being useful for determining rates of contaminant assimilation in the fish species of interest. Our staff have extensive experience in processing and aging otolith, scale, and spine samples, and we use a double-blind approach to aging, utilizing two independent interpretations of age for each sample. We have experience in aging samples from over 20 species of freshwater and marine fish. If requested from our clients, we also provide back-calculated length-at age data based on measurements of aging structures. 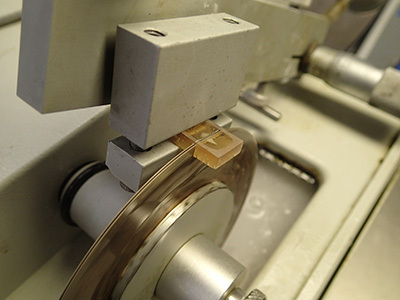 EcoLogic has the capability to process fish otoliths via thin-sectioning with a low-speed, precision sectioning saw. Otoliths and spines are thin-sectioned, mounted on a microscope slide, polished, and then interpreted for age microscopically. Scales are aged by creating an impression of the scale by placing it between two acetate slides and passing it through a roller press. We use a double-blind aging process in which each sample is aged independently by two interpreters to increase precision and reduce the potential for inaccurate age determination. Age is determined by counting the number of annuli from the focus (center) to the edge of the prepared otolith, scale, or spine sample. If a client requires length-at-age data for individual fish, EcoLogic has the software and equipment capabilities for measuring and calculating distance between annuli and converting these measurements to fish length at formation of each annulus. These data can then be used for determination of growth rates and other age-specific measures. Following is a sample list of waters and clients for which EcoLogic has conducted fish aging services.